I have defended myself for being nearly thirty years-old and never really getting into Oasis or their music in the mid-nineties (though I was only nine or so when they peaked so I don't really have to defend myself) by stating that I was the oldest of my siblings and thus had no older brother or sister to guide me in the direction of what was hip or cool at the time. I had to blaze my own path, dammit! This applies to other, more mature music and movies of that decade that I'm still not overly familiar with or don't have a strong nostalgia for, but I mention Oasis due to the obvious fact there is a new documentary surrounding the toxic band that could never get far enough past themselves to see what more they could have been to the rest of the world. And so, going into such a music documentary where I wasn't overly knowledgeable of the band, their history, or their music (I mean, I know "Champagne Supernova" and "Wonderwall", of course) I based how I would gauge the effectiveness of the documentary on whether or not I was inspired to search out and listen to more music by the band once the credits rolled. And to its credit, director Mat Whitecross' take on the band and their insanely fast rise and even quicker fall is as swift and level as one could hope to achieve when you're unable to get the two key members of the group you're focusing on in the same room for interviews. In other words, having to shape a single story from what would no doubt be two very different perspectives comes off more effortless than it likely was to actually pull off. Told solely through video clips that are cut together to form something of a re-enactment of the scenes and events being described Oasis: Supersonic is almost exactly what one would expect from a film titled as so, but through this easily recognizable structure and to someone uninitiated with the mythos of Oasis I found the enlightening early moments of how both Noel and Liam Gallagher fell into their roles in the band and how they evolved as the group gained more and more notoriety to be gripping and more than telling as to why the band met the fate it ultimately and inevitably did. Like a ticking time bomb waiting to explode the elements that made up the Oasis its fans will forever remember were never destined to remain together forever, but only long enough to produce the music they brand as timeless and curate the impressions and attitudes that will unfortunately always overshadow those songs. Of course, it is this sibling rivalry that has come to be the point of reference for Oasis that makes this a worthwhile documentary in the first place. It is their shameless shaming of one another that creates the tension of the narrative Whitecross is weaving as he appropriately opens with the anticipation and hype surrounding their legendary Knebworth shows that drew more than 250,000 people over two days and turns twenty years old this year. The band could have seemingly sold out seven shows to audiences of that same size and still be living off the residuals of those shows to this day, but ego gets in the way of a lot of things-sometimes even profit. And though the film uses the now cliché framing device of opening with a glimpse of the band at the top of its power and popularity only to rewind back to its humble beginnings and then wrap back around to those opening moments so as to make the journey from one point to another that much more effective it works in Whitecross's favor as he is able to gather previously unseen archive footage and photos of the brothers quarreling (to put it kindly) in the studio that shows us this love/hate relationship was embroidered in the DNA of the band from the very beginning. As the fame grew so did the level of resentment for one another. It's hard to imagine how it didn't go the other way-that within the fact these brothers who came from a single parent home and had next to nothing the majority of their lives and would come up to become one of the biggest bands Britain has ever seen thus allowing them to support the mother they clearly adore and surround themselves with everything they once desired-that they would be brought closer together by virtue of the fact they were able to do this together. And yet, their differences despite their shared childhood would simply remain too great to overcome. It's difficult to even argue that had Noel and Liam had a better relationship that the songs wouldn't be the same as the level of collaboration between the two on their music was virtually non-existent. And so, while these self-described head cases and their inability to set their egos aside are certainly what drove their band into the ground I don't know that it was also their greatest strength as Noel believes it to be-rather, it was their transcendent, inherent, genetic connection that made them a perfect balance-their egos and attitudes only got in the way of that divine connection. 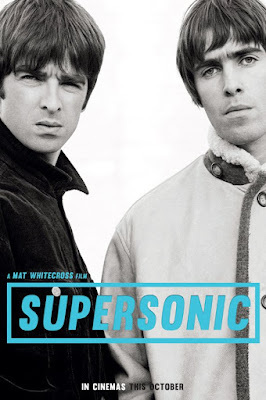 It is this connection between Liam and Noel that is rightfully at the center of the film as Whitecross is keen on pulling out of the two brothers exactly how the collaboration came about and how the songs were produced once a certain level of professionalism was achieved. In all honesty, the only reason Liam was in Oasis was because he had a desire to be in a band after initially considering such interests and behavior questionable whereas Noel would have never been in a band at all had his brother not started one. As it came to form-Noel would be the songwriter as he always played the guitar and wrote down lyrics, but it was Liam who had the swagger of a front man and could somehow sing Noel's songs better than even Noel could hoped to hear them. It is what could be considered a prime example of a symbiotic relationship. Oasis could never survive without both of the Gallagher brothers. While this aspect of the band is explored thoroughly through the events that occur between 1992 and 1996 by way of the incidents that serve to support the relationship between the two was indeed as harmful and virulent as the stories would have us believe what takes away from Oasis: Supersonic being a more insightful piece of documentary filmmaking is that it never really grabs at the roots of why these brothers felt the need to act the way they did. Viewers who are less initiated than this reviewer will be able to take note of the level of self-importance in many of the interviews from the heyday of Oasis and as a result be able to glean that Noel and Liam clearly had no shortage of self-worth in either themselves or their talent for making good music, but what was it about their environment, their nurturing, their inherent dispositions that made them act this way? Did Liam simply feel the need to overcompensate because he came from nothing? Did Noel do the same because he knew and admits to knowing he was never as outwardly cool or fearless as his brother or did both of them simply not care enough at all to follow any rules and as a result resorted to riding their high horse through every situation they encountered? If it is up to Whitecross' documentary we are to believe that the answer is the easiest of those, but by our natural inclinations as human beings we have to believe there is more to these bubbling hotheads than just disdain and daddy issues. Maybe one day, with more perspective from both Liam and Noel we might get a more penetrating portrait of what was and what could have been that is more emotionally affecting due to the greater amount of time that has passed and the realization that there really is no going back to do things a way they might have more preferred, but at the current ages of forty-four and forty-nine there seems no such care to tide things over and try again. What is apparent is that, Noel especially, recognizes the moment where Oasis was at the top of the world for what it was and that neither he nor the culture will ever be able to recreate that state of existence again. "It was a great time to be alive never mind a great time to be in Oasis," he says when discussing 1996 and the Knebworth shows that Liam would have, in retrospect, loved to be the final sendoff for the band-to go out on top-and never be heard from again. This recognition that Oasis could have only existed in the form that it did at that specific point in time and that they were lucky to have been born when they were and come up where they did and be exposed to the kind of influences they were that allowed fate to make them the biggest band in the world for a fleeting moment is not lost on either brother. This blows off the dust on those aging egos and shows there is maturity and humanity in their current outlooks lending even more curious questions as to why such introspection wasn't present throughout the entirety of the documentary. And yet, as these things go Oasis: Supersonic is still very much in line with what one would expect when readying themselves for an in-depth look at the life and music of a rock band from Manchester. The music is good, the rivalry between the brothers is intriguing and endlessly entertaining, and the stories-the stories of what went down and how the recording sessions were completed are worth the experience for not just any Oasis fan, but any music fan in general.